I was blown away by Dr. Parker’s rational take on why abortion does not contradict with Christian values. I appreciate that he acknowledges he was not always a proponent of choice, detailing out how his view changed through his upbringing in the poverty-stricken South, and his education and experience in the medical field coupled with a deeper examination of his faith. I have frequently questioned tenants of Catholicism, the religion in which I was raised (and made it through all the rites except marriage—that was in the courthouse for me), so of course hearing the account of a pro-choice Christian piqued my interest. 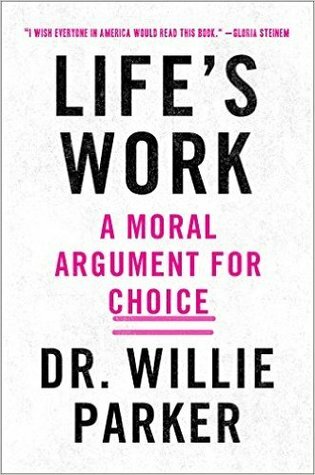 Life’s Work is fairly short and I admit I’m already pro-choice, so I’m predisposed to like this book and agree with a pro-choice viewpoint, but I still learned things from Dr. Parker, like the ulterior motives of elderly, right-wing white men bringing legislation down to try to ban abortion entirely. Obviously they twist Christian beliefs to try to achieve this, claiming it’s about “saving unborn children,” when really it’s about resistance to (our wonderfully inevitable) future racial and cultural diversity. I hope that people of all different ideological outlooks and faiths read Life’s Work. It’s an eloquent, though-provoking, brave memoir that I highly recommend. This entry was posted in books and tagged abortion, audiobook, feminism, health, memoir, non-fiction, philosophy, politics, religion, science, social commentary, society, women by kristin @ my little heart melodies. Bookmark the permalink.